Your gift can help students experience learning at its best; help us channel our research findings to key audiences; and enable communities to both harness and create relevant knowledge. Thanks to your gifts, ICER affiliates can make impacts that benefit both our local and global communities. Donations will be immediately issued a tax receipt via email. By giving to the Research and Knowledge Co-Creation fund, you are supporting Institute members who are eager to work with Communities on projects generated by Community identified issues. 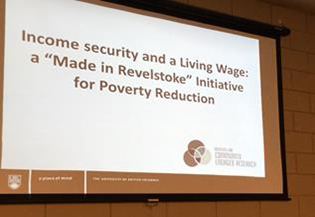 The Income Security and a Living Wage: a “Made in Revelstoke” Initiative for Poverty Reduction. The Revelstoke Community Social Development Committee requested members of the Institute for Community Engaged Research, and the Interior Health Community Health Facilitator collaborate with them to answer the question: What are the potential impacts of introducing a living wage in Revelstoke? The Institute for Community Engaged Research has over 30 academic and 20 community members who work on projects ranging from researching seniors aging in place to mapping disability resources to examining the role of place in well-being. The Student Experiential Learning Fund supports student opportunities to work as research assistants on these types of projects, or helps offset the costs of students’ own research. David Lacho and Lindsay Farrugia discuss Conlanging: the co-creation of language. One such opportunity finds students David Lacho and Lindsay Farrugia working with Dr. Christine Schreyer on the project, Sharing the Art of Language Construction. In this project, our goals are to enhance awareness about the process of language creation through the development of our documentary film, “Conlanging: The Art of Crafting Tongues”. 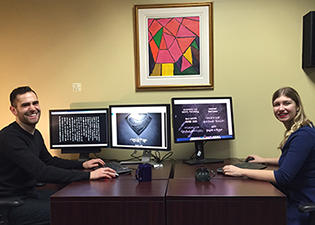 Our two interns, Lindsay Farrugia and David Lacho, are gaining valuable experience in research and knowledge about film production. For instance, Lindsay, a Master’s student whose research examines the created languages of J.R.R. Tolkien’s works, is our social media intern, connecting with the language creation community around the world. This project is providing her the opportunity to learn more about the world of conlanging, which she can apply to her own research. David’s Master’s research also focuses on language, but on language revitalization with Indigenous communities. His role in this project is to help transcribe the interviews we’ve conducted, which will aid him in his own research as he develops more skill at transcription, but also provide him new ideas about how constructed languages might be similar to endangered languages. Please consider donating funds to help support Institute affiliated students gain research and community engagement skills by donating to the Student Experiential Learning Fund. Open access journals and videos. Pecha Kucha events. Public workshops. Community Symposiums. These are some of the ways that the Institute creates opportunities for people to engage with knowledge findings and discuss pertinent issues. Excellence in research is most often the result of years of work and collaboration that yields relevant findings that are applicable to our lives. However, the knowledge gained by any research experience often takes time to funnel from academia to a broader audience. The Institute for Community Engaged Research is committed to connecting with communities about research results. 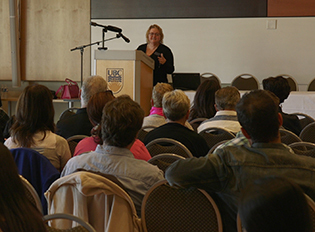 For example, in September 2015, after three months of planning, the Institute co-hosted a two-day symposium on Immigration to the Okanagan. Our partners included: Kairos; Okanagan College; Okanagan Nation Alliance; Kelowna Community Resource; Radical Action with Migrants in Agriculture; Roman Catholic Diocese of Nelson; South Okanagan Immigrant and Community Services. Over 180 community members joined us at one of the free events to discuss the impact of Canadian policy on immigrants, refugees and temporary foreign workers. The difficulties in the current system for community groups interested in sponsoring people, and help settle and support refugees, which is creating challenges in achieving refugee resettlement goals and effective outcomes. The consequences of immigration policies and practices shaped solely by economics – such as the temporary foreign worker program – for achieving social and social justice related goals. To create lasting resources from this event, we are editing the videos from the Key Note speakers (lawyer Sandra Hakanson; and Syilx Scholar Dr. Jeannette Armstrong) which will be available to the public on our website. Assistance with the costs of video production, would be greatly appreciated and can be made by donating to the Institute for Community Engaged Research’s Knowledge Dissemination Fund.